I hope you all had a great weekend! This is a look that will definitely be on repeat in my closet. I find myself gravitating towards subtle greys and soft pinks to create a lighter tone. Not to mention boyfriends + oversized tops - you can never go wrong with comfortable + chic! so classy! love how you styled those jeans! Love the shoes! The entire outfit is very chic casual. Nice post! Love the boyfriend jeans with the heels to dress it up. Love it girl! Totally swooning over this look!!! Love those shoes!! Love this outfit!! Definitely what's on my radar for spring!! 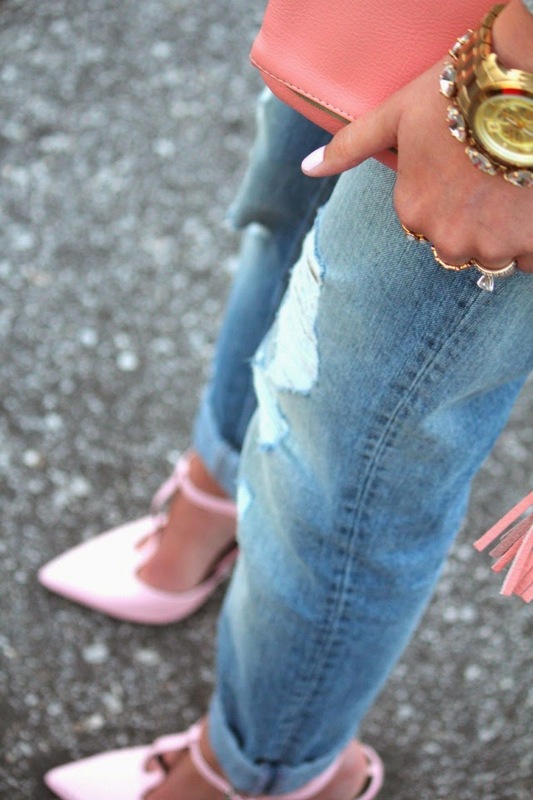 I'm loving the pink heel and boyfriend jean combo! Adorable...the jeans look great on you and those shoes are so cute! you always have the cutest outfits to share! I love the baublebar necklace. Love the distressed jeans look! Love, love, love those heels! Presh. Oh man, gotta love those pink Zara heels! I've been eyeing them for way too long... breaking down and buying them soon I'm sure. They looked great with your outfit! You're absolutely rocking the hell out of this outfit and especially those boyfriend jeans. I'm always wanting to wear them, they are so cozy and cute looking, but I just can't seem to push myself to do it. I'm so self- conscious as it is, so I don't want boyfriend jeans to make me look bulkier. I think that a heel with boyfriend jeans is a must! You have inspired me with this post. I think that you found a perfect balance. You look amazing! You are looking so darling in such a comfy outfit! I love those heels! Love this look. So pretty yet casual! That lipstick is beautiful! I've had my eye on those jeans! This outfit looks darling on you! Love the heel!